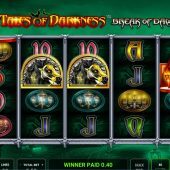 Tales of Darkness Break of Dawn slot is the second game in what seems likely to become a Novomatic series as we've only just had Tales of Darkness Lunar Eclipse and I can immediately see that this version is of considerably lower volatility than its predecessor. We have the same mysterious gothic theme with reels set over a spooky gate to a graveyard and music you'd hear in an old horror movie which this time isn't drowned out by the trotting sound of the reels. 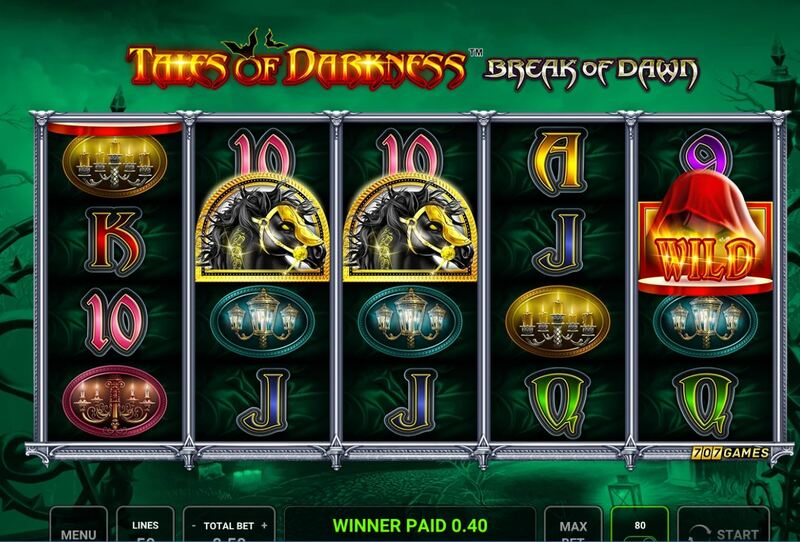 The symbology reflects that of a mysterious house with strange goings on which may have you thinking of Microgaming's classic Immortal Romance game but I've a strange feeling immortality won't be applied to our bankroll here! When I said this game if of lower volatility than the first in the series it was simply because we have 50 pay lines over 5 reels of 4 rows apiece which usually indicates a higher win frequency of lower pays. The symbols aren't stacked and the pays extremely low with the highest being the Horse at 150 coins for 5-of-a-kind and your 50-coin stake. You have 3 different colour Candelabras all paying 75 coins with six card values paying either 50 or 40 coins. That's it aside from Wilds which can either be the Red Female charcater or Purple Male character and Full Moon scatters of which all three can appear on all reels. Does this get any better in the bonus? If you see three or more Full Moon scatters in view 15 free games are yours. You will get an enhancement in that Wilds disappear from the reels bar the centre one which is now 5-rows high instead of 4 and you have 100 pay lines in total. Your two character Wilds will now expand when landing on reel 3 to fill all 5 rows of the reel and pay wins before awarding 2 extra spins in which the Wild reel moves off the grid one reel per spin. If it's the Lady her reel will move leftwards and the Male's will move off rightwards. You can also see a combined Wild now on reel 3 which represents both the Lady and Man as creepy couple and if this lands you'll have 2 Wild reels moving off in the 2 extra spins, one left and one right. You can land any other Wild on reel 3 during these 2 extra spins so if you got the combined Wild twice on the trot you'd get one spin with all reels bar 3 Wild, unless of course you were lucky enough to land a third consecutive Wild which would result then in a full screen! If you did this, as the Wild presumably pays the same as the top symbol you'd get a rather pathetic 100 lines x 3x stake or 300 times your bet.